Our beloved husband, father and son, Stephen Thomas Bryant, 50, died peacefully Sunday morning, May 28, 1995, from complications of M.S. He was born February 28, 1945 to Mabel Midgley and Thomas James Bryant in Salt Lake City, Utah. He married Julie Curtis in 1967, attended the University of Utah and graduated with a bachelor’s degree in 1969. After graduation, he went into the Army and served in Vietnam. 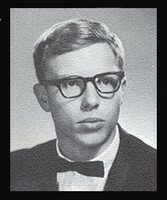 After his return, he entered the University of Utah Law School, graduating in 1974. He passed the Bar exam that summer and began working at the Salt Lake County Attorney’s Office. He later entered private practice. He was well-known for his generosity, friendship and wonderful personality, and he will be missed by all of us. He is survived by his wife Julie; daughter, Cynthia Anne; son Taylor Curtis Bryant; his mother; sisters, Betty Baker and JoAnn (Peter) Russell. His father preceded him in death. Memorial services will be held May 30 at 1:30 pm at Russon Bros. Mortuary, 255 South 2nd East, Salt Lake City, Utah. Does anyone know the details of Steve's passing? at life's end was I believe about as horrific. He had a great deal of integrity.